Summon: Secretly choose an enemy creature. Berne Clan Nightstalker is a legendary Agility creature card. It is part of the Houses of Morrowind expansion. "As long as you're here, try to be useful." "You do serve a fine feast." 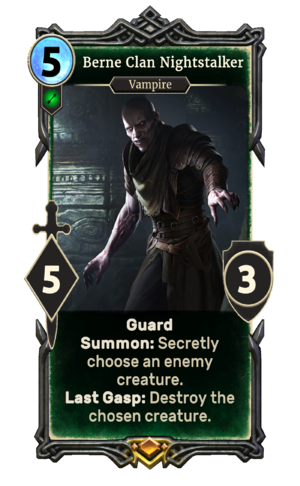 The card depicts Raxle Berne from Morrowind. This page was last modified on 2 March 2019, at 00:23.